The preferred test method for measuring a “live antenna” or transmitter’s performance, is far field apparent power (EIRP) data. We use our pre-calibrated path losses and positioners to plot your device’s EIRP in dBm. With this method, your pattern shows EIRP (apparent power) in hundreds of test directions. This type of pattern is a typical final test of a transmitter or transceiver with an integrated or attached antenna. Any issues with antenna performance or “matching” will be discovered. 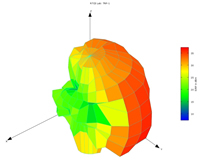 We will also supply the calculated Total Radiated Power (TRP) of your transmitter, based on the spherically integrated EIRPs in any 3D pattern. The shape to the left is the EIRP pattern of a 2 Watt (+33 dBm) GSM cellular modem. The device is supposed to be omnidirectional, but the pattern shows otherwise. Also, this device has an FCC mandated maximum peak EIRP of 4 Watts (+36 dBm), which can be seen to be exceeded in the “-X axis” direction of the 3D plot. We also calculate for our customers their Total Radiated Power (TRP) by integrating over the surface of the spherical pattern. Knowing your TRP along with your conducted launched power, allows antenna radiation efficiency to be calculated. Many modern “wireless” products seek ultra small antennas, and antenna efficiencies can sometimes be very poor (10 to 20%).